Mixing glass enamel for enamel painting on fusing glass can be done by using a glass muller or a palette knife. In either method the dry paint powder is combined with a paint medium such as A-14 which is water soluble and easy to clean up. The use of a medium allows the paint to be mixed to a smooth consistency, whether it is thick or thin. Using these methods will produce enamel glass paints suitable for glass fusing projects fired in a glass kiln. Alwayswear a face mask or respirator when handling dry paint pigment. A glass muller is the traditional tool used to mix paints. This style of mixing is used when dry sifting is not required for the final outcome. Muller's come in various sizes and weights which aids in the mixing of the enamel powder with a painting medium to produce a usable paint mixture. Generally a muller is used with a sandblasted piece of glass on which the paint is placed, combined with medium and then mixed with the muller. The combination of sandblasted glass and muller grinds the enamel powder to a smooth consistency. The addition of a painting medium will help determine the paint thickness. 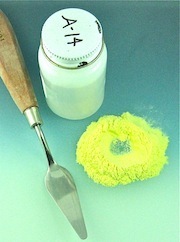 A palette knife can be used to mix dry powder and chosen medium. The paint can be mixed on a plain piece of glass. The result will not be as smooth as using a muller but is still quite acceptable. The heavier the glass the less it will move around during the mixing process. Only one side needs to be sandblasted. If a sandblaster is not available then the glass can be grained by rubbing with 200 grit silicon carbide and water. Another piece of glass is used to rub the carbide over the smooth side of the float glass. Firstly sprinkle carbide across the surface, wet with enough water to produce a slurry. Using the smooth side of the glass rub the slurry with a figure eight motion until the glass is nicely grained across the total surface. To mix paint place dry powder on glass, make a well in the center , fill well with medium and commence to move muller in a circular motion. During the process scrape paint from the edge of the glass back to the center and continue to mix. Add more medium when needed until you achieve the desired thickness. The end result will be a very smooth paint with no large paint granules. Place paint into an air tight container for later use. Paint will keep indefinitely when stored this way. Clean float glass and muller with water. It is not necessary to use a piece of sandblasted or grained glass with this method. The float glass should still be the same dimensions as the glass used with a muller. Place paint granules on glass, make a well in the center and add medium. Use the palette knife to turn and mix the paint, adding more medium as necessary until the desired consistency is reached. Once the paint has been mixed correctly there should be very few granules visible. Place finished mixture into air tight container where it will keep indefinitely. Use water to clean glass and palette knife.